Above postcard the same as above but tinted. Kindly sent by Rory Kehoe. Above image from Google, April 2012. 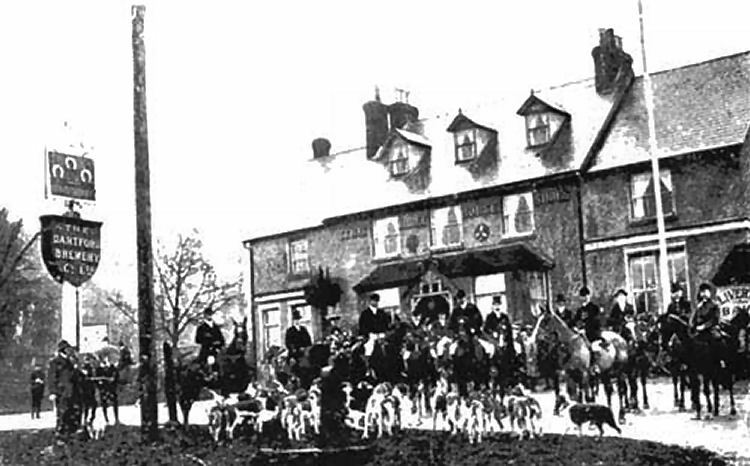 The "Three Horseshoes" is believed to date back as far as 1753. It was then known as the "Horseshoes" and was a coaching inn as the road to Chevening was the road to Rye. Local persuasion has it that the entrance step is the same height above sea level as the top of the dome of St Paul's cathedral. 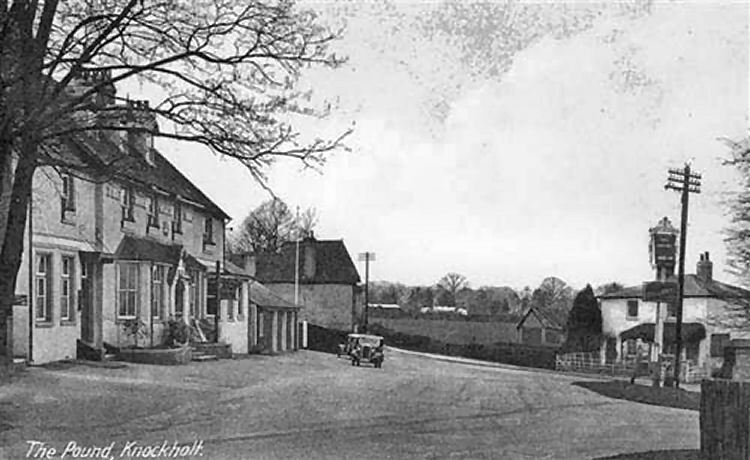 Legend has it that William the Conqueror watered his horse at a dew pond where the Knockholt beeches now stand - the highest point in the highest village in Kent. 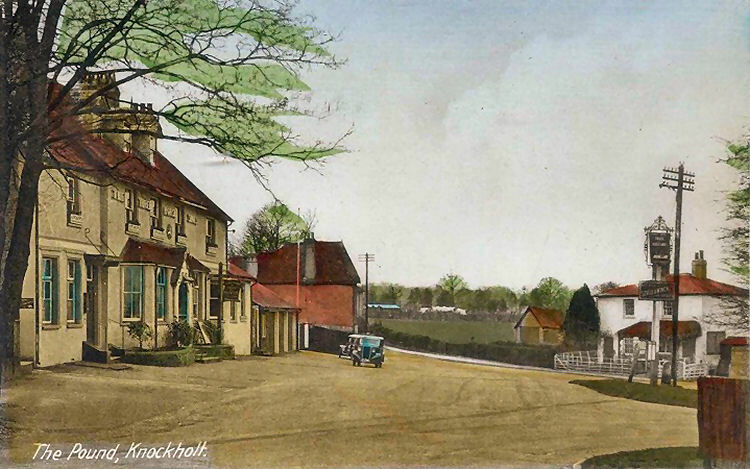 Knockholt used to be a busy commercial centre with farmers, fruit growers, shopkeepers, builders, blacksmiths, butcher, bakers etc. There was still a blacksmiths in the village in 1915 with the forge next to the "Three Horseshoes." By 1938 commercial life had declined with only a few trades remaining. During the war years Ivy Farm, situated behind the "Three Horseshoes" was used as an outstation of Bletchley Park functioning as an intercept or relay station for radio signals. This work was concerned with Ultra, the breaking of the German cipher said to have been the single most significant achievement to have influenced the outcome of the war. It was so secret that the village and those that work at Ivy Farm themselves had little idea of what was going on. The gates to Ivy Farm were guarded by military police, and the area surrounded by barrage balloons, which gave a feeling of security during the V1 raids. Workers often had lunch at the "Three Horseshoes" but wartime food was very basic. The station is 3.0 miles north-northeast of the village of Knockholt but closer to several other settlements. The station serves several small communities in the Sevenoaks district in addition to Knockholt. Many people often wonder why the station is not named after the village within it sits. To avoid confusion with Halstead in Essex and due to Badgers Mount not entirely fulfilling the criteria for being a village, it was named after the next closest village, which is of course Knockholt. E. S. Nesbit, resident in Halstead, set her famous novel "The Railway Children" in and around the station. The name "Three Horseshoes" is the heraldic symbol of the Worshipful Company of Farriers a Fellowship since 1356, chartered in 1674. The assumption is that the design employed only three shoes as the other one was being worked on or replaced by the farrier. Pubs bearing this name were probably owned by the company or by its members. Some signs, however show horseshoes gathered around a stake in the ground, representing the horseshoe-throwing game which was popular at the time. Horseshoes have been used as pub signs for centuries. With a largely illiterate population visual signs were an important means of attracting customers and in 1393 Richard II issued an edict requiring all who brewed and sold ale to display a sign to enable the ale conner (tester - Shakespeare's father was one) to locate the premises. A horseshoe sign was a popular choice because it was an easily recognisable symbol and had the added reputation of being able to combat witchcraft. It was also associated with good luck, a superstition to which Lord Nelson, himself widely featured on pub signs, subscribed. 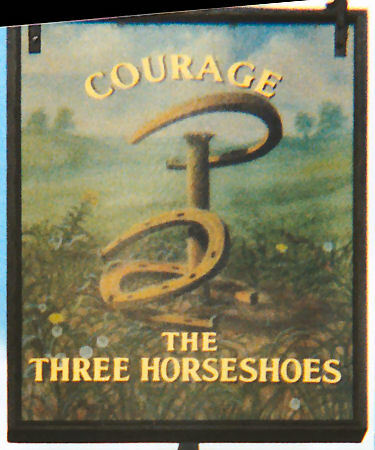 In addition to the "Horseshoes" and "Three Horseshoes," there are pubs named "Four Horseshoes," "Five Horseshoes" and "Nine Horseshoes." 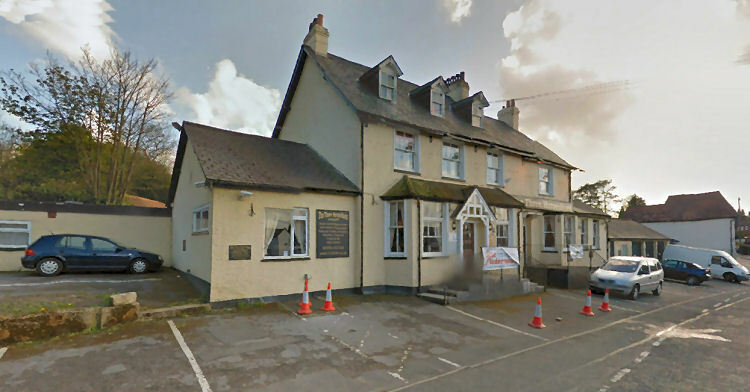 In 1753 the Landlady of the "Three Horseshoes" in Knockholt was Ann Lambert, there has been 35 Landlords/Landlady's since then. Today it is run by Sheena Welch who has been here since 2001. From the Maidstone Telegraph, Rochester and Chatham Gazette, 28 September 1861. A friendly game of cricket was played at Knockholt on Wednesday, the party afterwards partook of an excellent supper at the "Three Horseshoes Inn." Unfortunately the dates for most of the following licensees are as yet unknown, but I believe they are in the correct order.